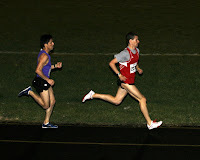 A couple of pics from last night's mile. "Coach" Klim can be seen lecturing Joe and Christiam on why their 6th 200m was 2 seconds slow than their 2nd 200m...huh? Was it a successful night under the lights? The 10K at Hains Point went pretty well. Great conditions and unusually calm winds on the way back. 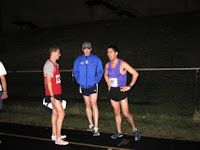 I went out with Crane, B Rod, and my buddy Saki for the first half mile, then backed off because it felt a bit too fast. They ended up going through the first mile in 5:11, with the next group two seconds behind. I felt great through the first three (5:13/5:16/5:17) then my legs began to feel heavy. 5:26, then 5:28. The strength from the marathon training kicked in at the end and I was able to keep it together... 5:27 (67). 33:17 10K.